Jaisalmer also known as ‘The Golden City’ is located in the Indian state of Rajasthan on the western frontier between Pakistan and India. The town lies in the heart of Thar Desert, on the edge of yellowish sandstone. It consists of the Royal palace and several Jain temples. The town is famous for its number of historical places. 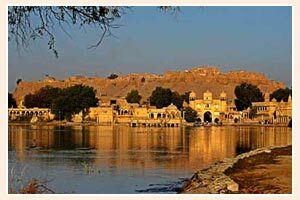 The Jaisalmer fort is one of the most important historical monuments of this place. Camel ride in the desert is a popular highlight that attracts number of tourists every year. Number of ‘havelis’ can be found here that depicts fine sculptures and historical architectures. There are also several museums that portray the culture of this place.